With the global use of smartphones, users have eagerly either looked for or developed their own tweaks that would make their device experience easier. The idea of these apps is to save time by automating particular tasks or giving shortcuts to some of the most often used settings. One of these tweaks is known as SBSettings and it gives users access to a variety of the most used settings on the device. 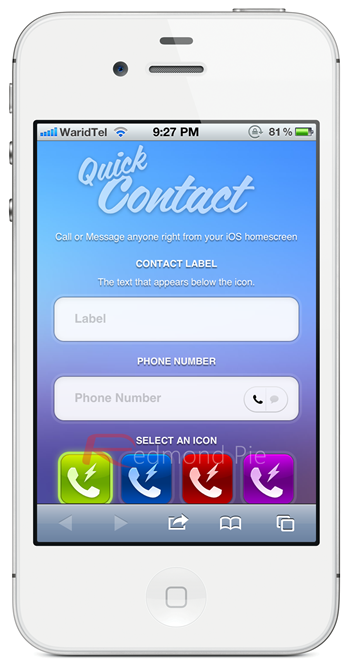 The most recent tweak is the one called Quick Contact. This is a web based service that brings Android type contact shortcuts to your hands. Created by Jeff Broderick, this service gives users the ability to set up Springboard shortcuts to quick dial, or compose a quick text message to any user of your choice. These quick shortcuts are displayed as icons on the Springboard of the device. The icon image is set from a list of defaults inside of the app, and the name is defined by the user. Currently in Quick Contacts there are fifteen options that you can choose from as far as the icon artwork is concerned. You can however, upload your own icon artwork if you have some of your own that you would prefer to work with. After taking a closer look at this service, you can definitely say that it provides a great function. The question remains however if the function is really that useful. It seems as if there are a lot of developers that are using URL schemes to offer user shortcuts. Now shortcuts can be very useful, but one can always wonder if it is quicker than just going in and adding a contact to the favorites list of the phone application. If you use Quick Contacts, the app still has to start Safari and then launch the phone app. 0 Respones to "The Quck Contacts Application"